The Perth Mint of Australia has started accepting orders for the 2013 “Mini Roo”, a button sized coin which contains one half gram (0.016 troy ounces) of 99.99% pure gold. 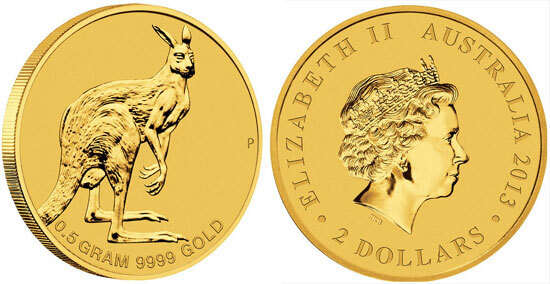 The Mini Roo was introduced in 2010 with the intention of allowing more people to have the opportunity for gold ownership by providing a very low price point. For the inaugural year, the Perth Mint sold 15,713 of the diminutive coins. The offering was repeated in subsequent years with sales of 14,852 recorded for 2011, and 18,002 recorded for the 2012-dated issue which still remains available for sale. The 2013 Mini Roo features a depiction of a kangaroo in a traditional stance, as designed by Wade Robinson. An inscription on the reverse reads “0.5 Gram 9999 Gold”. The obverse contains the Ian Rank-Broadley effigy of Queen Elizabeth II with the “2013” date and the face value of “2 Dollars”. Issued as legal tender under the Australian Currency Act of 1965, the coin will be produced on a mint-to order basis with a maximum mintage declared 12 months after the initial release date. Technical specifications include a diameter of 11.60 mm and thickness of 0.70 mm. Each coin is housed in a protective capsule and presented on wallet sized card. 1/2 a gram? Really? What’s next , A gold micro dot? A dime is 2.27 grams. And what are they selling it for …$5000 /oz?